X-Small - $26.99 Only 9 left! Small (4-6) - $26.99 Only 5 left! Large (12-14) - $26.99 Only 1 left! The reports have been coming in for weeks, now. A whole batch of radioactive candy came shipped out of the notorious Raccoon City. At first, the candy tasted just slightly sweeter than typical, but the ravenous hunger for more quickly came. The monstrous hunger for candy of all variety simply couldn't be halted. At first, it appeared to be quarantined into fictional towns exclusively. Unfortunately, we all know what happens when something seems exotic, dangerous, or simply sweeter-tasting! The corrupting candy has been stolen out of the blockade and it’s deliciousness has already gotten into the general populous. Fortunately, the signs are pretty easy to recognize. One: A deep interest in candy of almost any kind. Two: Increased energy, especially after ingesting candy. Three: The proclivity to say, “No,” or, “But, I don’t want to,” when asked to do their chores. If your kiddo is exhibiting any of these signs, it is likely that the virus has taken hold. 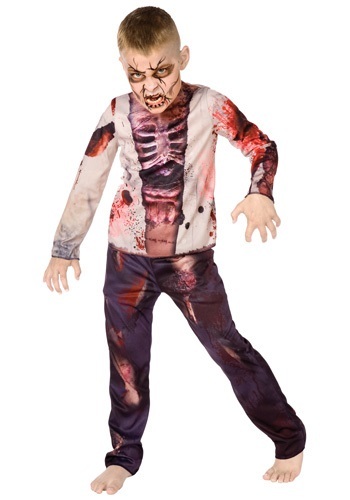 In such a case, all you can do is pick up this Zombie costume to better help the transition from normal kiddo to ravenous candy zombie. This rib cage print and blood splatter accented shirt fastens in the back with Velcro and comes with matching blue pants that share the bloody bone design. Pick up a zombie makeup kit or a variety of other spooky accessories and your tyke will be ready to infect the rest of the world with their own unique style. One of them has to have a latent antivirus, right?